My grandmother, with whom I spent some of my growing-up years, was a concert pianist and organist. I spent hours under the grand piano in the living room, listening to her play. 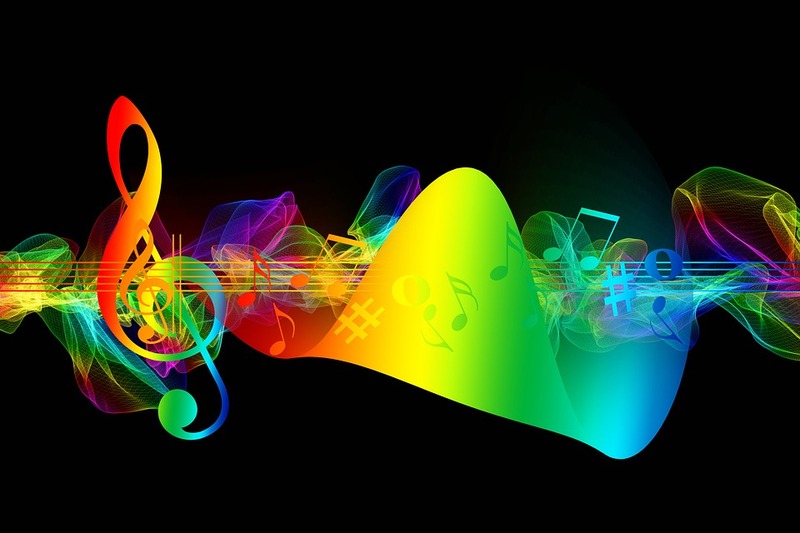 The DNA of music got into my system and I feel it in my soul, even though my piano and organ lessons never led to any great accomplishments, beyond playing for the church choir many years ago. But I find that music has helped me develop rhythmic intelligence so that, when I write, there is a subconscious attention to rhythm and pace of a poem. This influences not only rhythm, but also sound, line break and cadence. When you listen to classical music, for example, these factors contribute to your emotional response, don’t they? For today, I’d like you to write a poem that incorporates elements of music. It may be on any topic, including music, but what will come through is a recognition of the influence of music. You may even want to put on your song-writer persona and use a familiar or original melody as a basis for your poem. To help with this, I’m offering a few musical directions, notations and genres to inspire your writing. There are so many more; I could go on and on. Try googling music notation and/or genres. It may help to listen to a composition and get a feel of its characteristics, emotional content and genre before you write your poem. • Have a rocking good time! For dVerse, this is Victoria, happy to be your hostess today. I look forward to serving you some word-nog and reading your poetry. Welcome, my poet friends. I look forward to sharing music with you today. Upbeat or slow, blues or concerto. Let’s see what you have. Good evening from North Norfolk, Victoria, and thank you for the musical prompt. I’m going to post, do a bit of reading and then run, but I will be back in the morning. I wish you lullabys, Kim. Looking forward to your music. Thank you for this wonderful post Victoria. It is great in all its permutations. Thank you, Toni. It does offer a plethora of possibilities. May your afternoon be dolce. So it’s come to this, has it? *sigh*. Enjoy. I’m going to grab some lunch…12:30 here. Feeding off a comment on another verse, in this I look to meter, on purpose. Is there a music in it, or just a beat? Is it too strained? Looking forward to reading in a few. No, it fits. Use of meter (especially if it’s not your usual MO) is a key musical component. What a wonderful prompt! Thank you, Victoria. When we adopted our 3 year old son, the state said ‘he probably was mildly retarded and would never be a rocket scientist’. We were parents without any knowledge just instincts…but we gave him a Suzuki violin, later a cello and then a baby grand piano. This ‘so-called’ retarded child starting composing right away. At 4, the ‘Monster concerto’ (pretty abstract and LOUD) for violin, at 6, he loved the cello, but that was for much later, and at 7, the piano was the basis of his intellectual development. He composed mostly in ABA form…but it was wonderful. We hold that music not only soothes the savage breast, but develops a locked up brain. He was a throw away child for the state, but we are glad we caught him. Music was his salvation. Jane, this just gave me the chills. What a wonderful testament to the power of music and to you as parents and special human beings. Thank you for sharing. Thank you, Victoria. We made many mistakes. Many. Like sitting him down to a plate of spaghetti and a knife and fork at 3…and he hadn’t developed the ‘swallow reflex’ because in foster he was fed baby food exclusively. He almost choked to death, and that was the first night. Poor child survived US! LOL! We were flying by the seat of our pants then….and probably now. Thank you, Victoria. it was a steep learning curve. Bless you Jane. What you’ve done is magical. I was adopted, and every day I’m thankful for my parents. Bless you, back, erbiage. We saw so many things in state run foster. Good and bad, but unfortunately, mostly bad. But adopted children rest right under the parent’s hearts. Our son faced so much. He was only 24 lbs at 3…and didn’t speak until he was almost 4…and then never stopped! LOL! I remember going to the local Kmart to buy a potty, diapers (he was still in diapers at 3), etc. Walked out proudly as a new momma….to the car….and forgot the child. Turned around and he was standing at a Kmart window with his hands raised. I will never forget that…and even today we laugh about that. Early motherhood. LOL! No, but at the time….it felt like that. I was 43 with a 3 year old..never having been around children….so you can imagine the issues. However, though he got nasty in the navy for 4 years….first time out in the world….he’s a great young man now. Something must have been looking over us because it was touch and go for a long time. Jane, this is just wonderful. Your son is blessed, and so are you. I am counting my blessings as I write. Thank you. What a wonderful testament to the power of music and, at the same time, the power of love! Thanks, Lillian. Music is definitely the salvation of so many of us. Many apologies. Had so much fun with friends, I will get around tomorrow instead. Victoria, I loved this prompt. Music makes the most beautiful words. Thank you. Wonderful prompt! Our two children started with music early. My dear father gave us his very small Lawry’s ogan when he and my mom sold all their earthly goods and moved into a traveling trailer. Our daughter asked for lessons from age 4 and we always said, when your feet reach the pedals! She is now on faculty at Phillips Academy in Andover, MA, their organist and teacher; has traveled,studied and performed on the pipe organ in Europe and the US. Who knew? Our son continually beat on the back of the chair of people in front of us at concerts…at 5 we started him on drum lessons (on a practise pad) — I cut cirlcles into 4th, halves, etc to teach him the rhythms of drum (no notes in drum music) — then later he took up piano, composing, the vibraphone. Went to university on an academic and music scholarship. Now music is an avocation for him and he is deep into computer work. Again, the power of music and its connections to the brain and math and feelings! What a happy story, Lillian. So many of us have been touched by music and it has affected not only us, but our families. Wow! that is truly inspiring, Lillian. They really went far with their music. Good parents supporting and encouraging you were. Late to the bar and tired after a long day of teaching music…funny huh? I’ll write and catch up with comments tomorrow. Great prompt. Finally got one together…a bit grim, but too often real, though this is a fictional account based on news–sad to say. Intriguing prompt, Victoria! I had a meeting to attend so just coming in now….will think on this. Loved the miracles of music in Jane and Lilliian’s family stories here tonight. Me too. Music is so important to us. Thanks for the fun and original prompt. I apologize here and now for my contribution. Oh, no. Apologies not needed. You’re here. Loved the inclusion of ballet. Hello, a bit late tonight, but I will be around to all your poems tomorrow. And I’m just dropping in on Fri. Morning. I have an appointment in an hour but will read what I can. Thanks, everyone, for being here. Hello, I share an older poem with you. One that I hope captures the elements of your challenge. Best wishes. Sorry I’m late in responding–I look forward to reading it.